Shaker Heights’ Moreland neighborhood is a unique little corner of a historic city. Once its own community known as East View Village, the village was incorporated into Shaker in 1920. Situated on the city’s south side, revitalization efforts in recent years have brought about a vibrant community that takes pride in its history and embraces its future. The Make Your Mark on Moreland project is the area's latest step forward—utilizing public art to not only enhance the neighborhood, but also to honor the people and events that have shaped Moreland. A call for artists in February kicked off the project, seeking submissions for noteworthy gateways and historical markers in Moreland. Design concepts had to embody cultural and social identities and define a dynamic neighborhood steeped in history and poised for growth. To share more about this notable area, Moreland residents are working with project partners at the Cleveland Restoration Society, the Shaker Historical Society, and Cleveland State University to receive training on gathering oral histories from long-time residents.The group has just published a history of Moreland through Cleveland Historical. Lewis cites noteworthy locals like congresswoman Marcia Fudge, Max Ellis (the original Mr. Jingeling), former Cleveland Foundation director Steve Minter, and Carl and Louis Stokes as just some of the people who came from the Moreland neighborhood. Retail has thrived in what is today Shaker Towne Center, with mom-and-pop businesses like Kin-Lee Chinese restaurant, Gay’s Shoe Store, the Shaker Music Shop, Hough’s Bakery, Bilsky’s Bakery, and Glin’s Grocery & Market. Work by Charlotte LeesA jury made up of members of Shaker’s Public Art Committee selected artists Scott Goss for the gateway work and Charlotte Lees to create historical markers. “We’re very happy with the quality that we got,” says Lewis. “The jury agreed that these two concepts best captured the spirit of the community and the importance of the neighborhood.” Both artists cited a desire to enhance the pride of place within the community and were awarded $500 for their submissions. Inspired by the architectural diversity in Moreland, Goss plans on constructing 29 welded steel doors, each modeled after a front door found in the neighborhood. His concept invites viewers to interact with the doors by finding styles most like their own. The doors will form two towers representing the area's gabled-style houses and will create a large-scale uppercase M, for "Moreland." 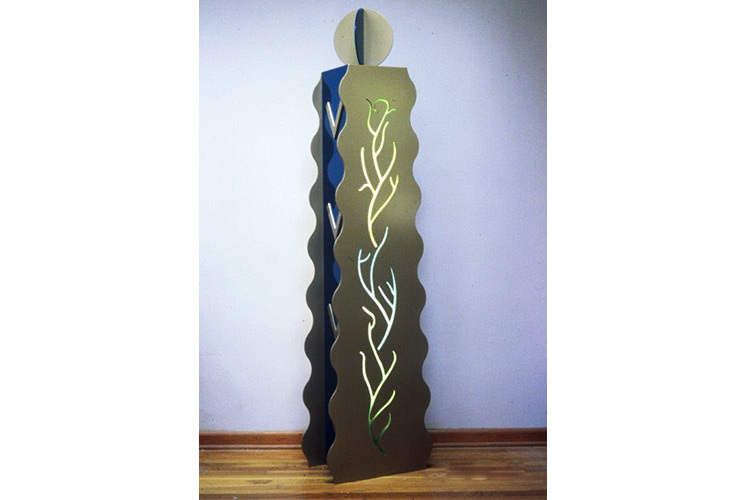 Goss’ work can be seen at the Cleveland Clinic, Cleveland State University, and in private collections throughout the country. An artist who works primarily with metals and wood, Lees proposed colorful, sculptured historic markers. The concept combines contemporary design with historic visuals, inviting visitors to walk around them and view the messages from several perspectives. Preliminary sketches reference building blocks that incorporate images and words to help the viewer interact with the work. Her work can be seen in the collections of MetroHealth Hospitals, the Cleveland Clinic, University Hospitals, and Akron Children’s Hospital. A special $500 Ingenuity Innovation Award was also given to sculptor Nelson Morris for his 1,000 Faces project, which was showcased at IngenuityFest and Eton Chagrin Boulevard this past winter. The installment will be erected on one of three vacant lots this summer. 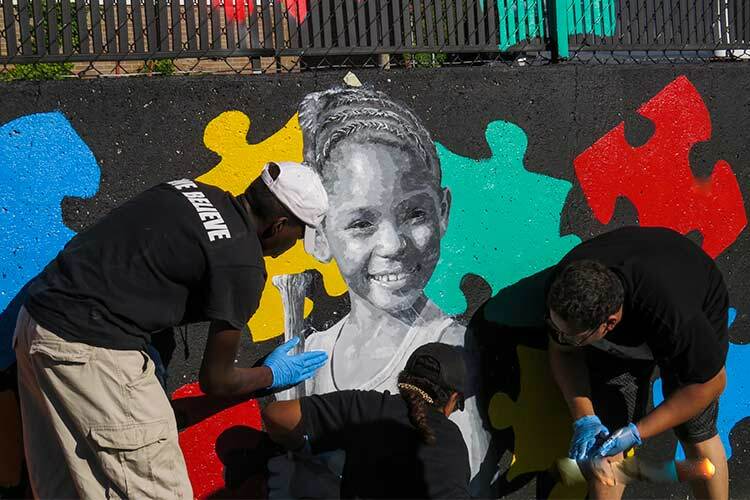 The first project to be completed in the Moreland public art project was the Faces of Moreland mural, which features actual faces of residents and jigsaw puzzle pieces. The mural is now installed at Chelton Park. Lewis says much of the discussion centered around the gateway's placement (with many favoring Hildana Park on Chagrin Boulevard), and how to best tell the community's history through the historical markers. She said many residents began talking as though the art pieces were already in place. "The way in which art brings residents together to positively discuss and reimagine their neighborhood never ceases to inspire me," Lewis observes. The Make your Mark on Moreland project is partially funded through a grant from the National Endowment for the Arts (NEA). Ingenuity Cleveland is the producing partner for programming. Kent State University’s Cleveland Urban Design Collaborative (CUDC) is a programming partner supporting community outreach efforts.